Since decor8 launched Reader Spaces a few short weeks ago, you've already toured Geninne's Mexican Retreat, Danielle's Serene in the City apartment in the Netherlands, Archana's Colorful Home in India, Jonathan's Retro Flashback, and Rachel's Happy Home in Louisiana. 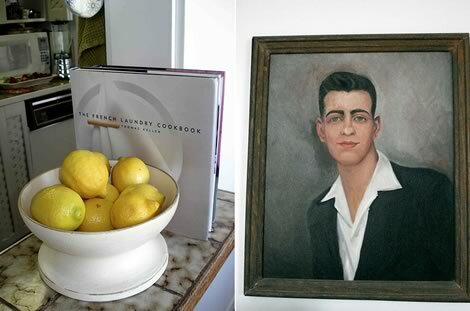 You've also helped a few readers, like Courtney and Heather, who both needed design advice for thier kitchens and looked to decor8 readers for help. So far, this new feature is going well so as long as readers keep sending in questions and home tours, we'll keep it up! Next on our list of home tours, Victoria Smith shares with us her utterly charming art-filled one bedroom rental apartment (with terrace!) 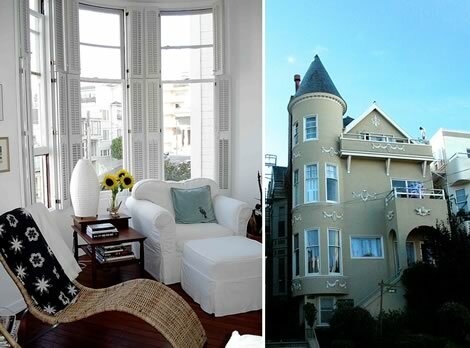 in San Francisco's Pacific Heights. 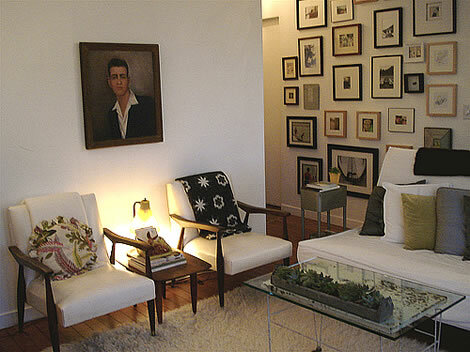 Filled with cleverly arranged objects and lovely art, she adores "eclectic-modernism - kind of Bohemian Modern. 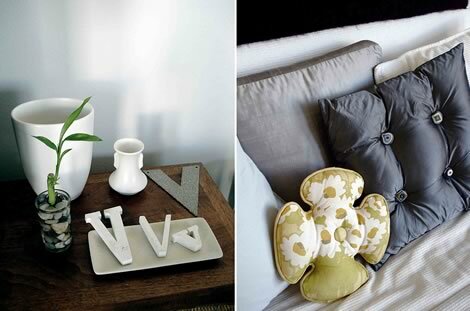 Flea market finds mixed with contemporary pieces. 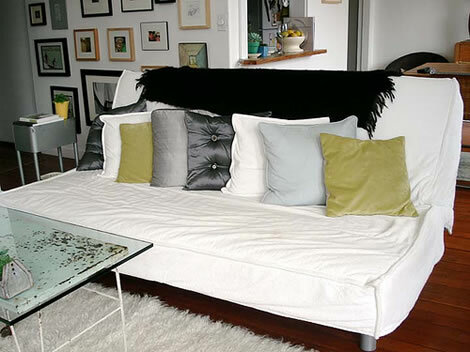 Lots of white with colored pillows, accessories that I can change out to a different color when I get bored." Victoria's favorite designers include older, modernist designers like Eames, McCobb along with Todd Oldham, Angela Adams, and Jonathan Adler. Finding treasures at places like West Elm, CB2, Amy Butler, Anthropologie home, eBay, and Craigslist, along with her many travel adventures, she's pulled together a beautiful space that will certainly inspire and perhaps give you a fresh perspective, along with lots of ideas for experimenting in your own space. 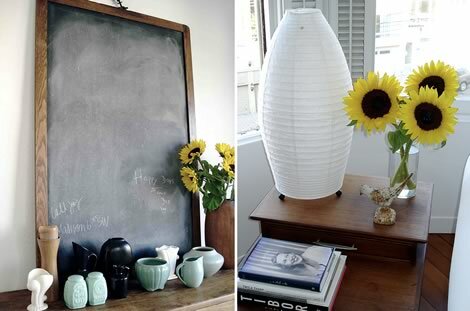 Some of Victoria's favorite features in her apartment, "The light especially. 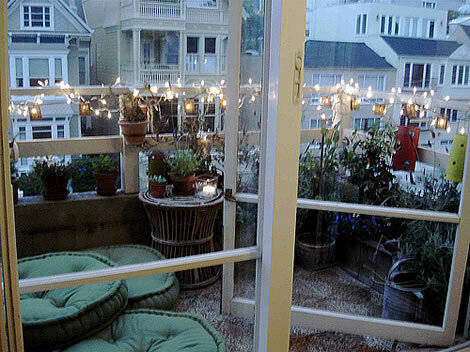 The bay window, definitely the working fireplace, and the terrace. The stained glass windows in the bedroom are pretty cool, too. Oh, and the extra large bathtub." She also adds, "My neighbors are amazing - we call our building 'buchanan manor' and everyone looks out for each other." 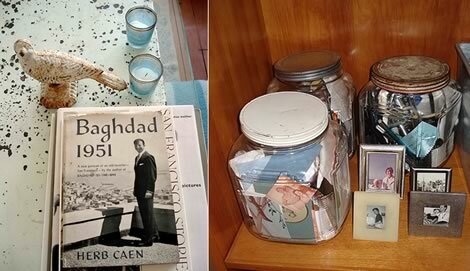 Interesting fact: Herb Caen, the famous Pulitzer Prize-winning San Francisco newspaper columnist, lived in her apartment at one time. If you'd like to see the grand tour of Victoria's space, featuring 69 full size photos, click here. Warning: Gorgeous drool-inducing shots. 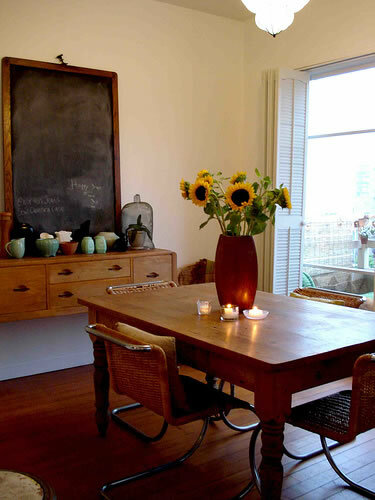 May inspire you to stop everything you're doing and redecorate your home. A long hallway leads into the space, it was a blank canvas just waiting to be transformed into her own little gallery. The hallway opens into her living room area where there is a fireplace and a sitting area near bay windows. 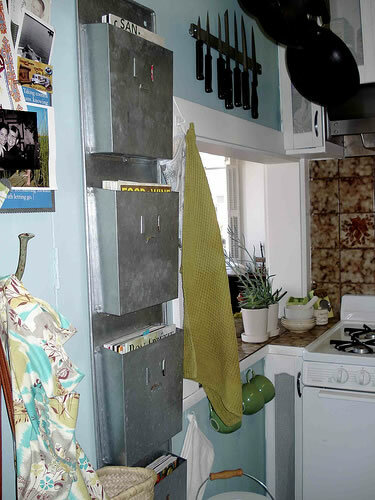 Kitchen - Some of her kitchenwares - knife and pot racks from Ikea, her galvanized metal magazine rack for holding cooking magazines and her favorite Anthropologie apron. Great paint color on the walls, don't you think? Dining Room - A San Francisco view from her dining room. Mies Van Der Rohe chairs. 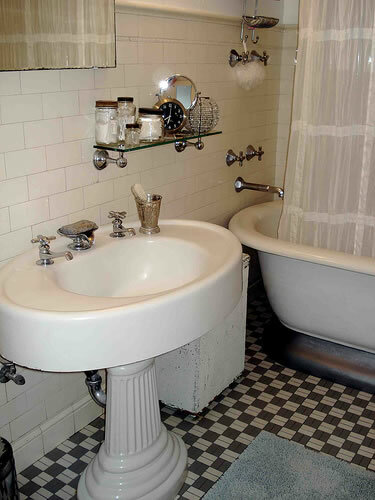 tub, gorgeous sink and fabulous tile floor. Drool. 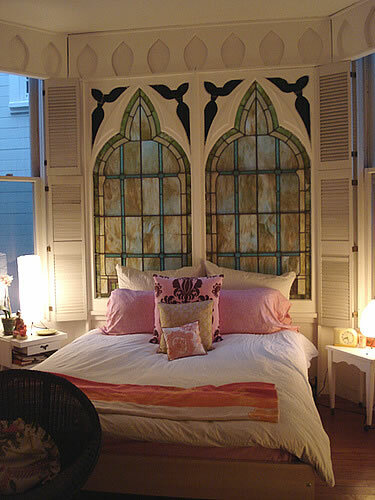 Bedroom with 'Church Bed' complete with gothic stained glass windows. More great collections. 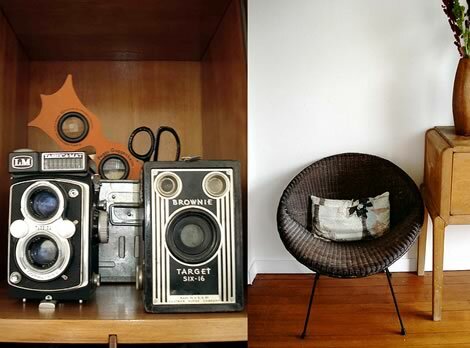 These are Victoria's favorite cameras along side her Peggy Guggenheim kaladiscope glasses, purchased in Venice at her museum on the Grand Canal (it used to be her home). Wasn't that a lovely tour? Thank you Victoria for welcoming us into your amazing space! Hudson - New Home Design Store in Boston's South End!